We ALL must have this same experience. As a kid growing up, you are asked to do chores that are terribly annoying. For me I was always having to fold socks (a common request that my mom would make while I was talking on the phone with friends). I can still hear, “Cathy, c’mon, you have socks to fold,” or something to that effect. One chore that was rather unique and definitely high on my annoyance chart was washing and drying plastic bags. There was this constant pile of bread bags and Ziploc bags beside the kitchen sink (or so it seemed at the time). My mom would wash them and cram them onto the bottom of the drying rack for me to take and either dry, or hang up on the clothesline in the basement. What fun it is to be green….and frugal, a combination of traits passed along from my mom’s side. She grew up on a dairy farm. And as it is often the case on a farm or a small business, you make do with what you have, are not wasteful, and understand the value of a dollar and hard work (just to name a few life lessons). As an adult, I SWORE I would not be washing plastic bags! 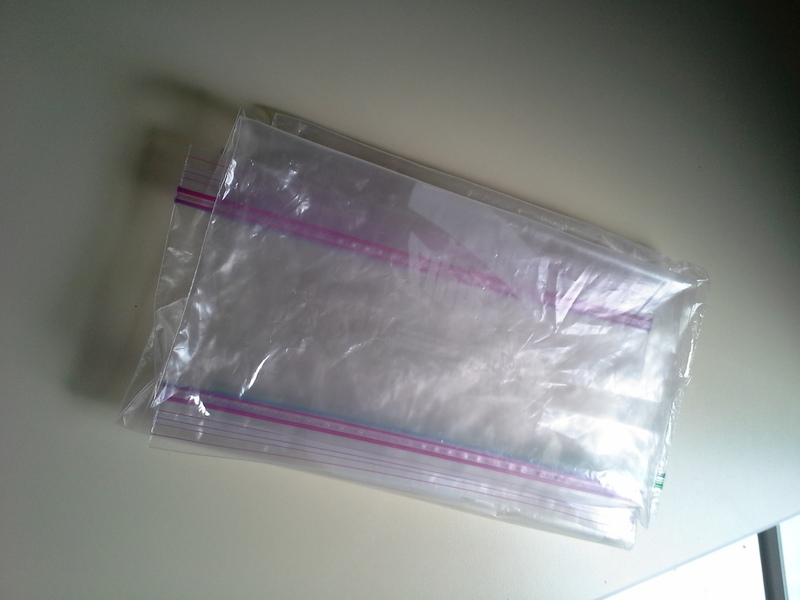 Years later I met my now husband and saw that he too grew up in a family that re-used Ziploc bags, and he readily washed and dried such bags on his own as an adult. A match made in heaven, right? Over the weekend I had to chuckle as I found myself doing that very thing I swore I would never do (and have been doing since meeting my husband). 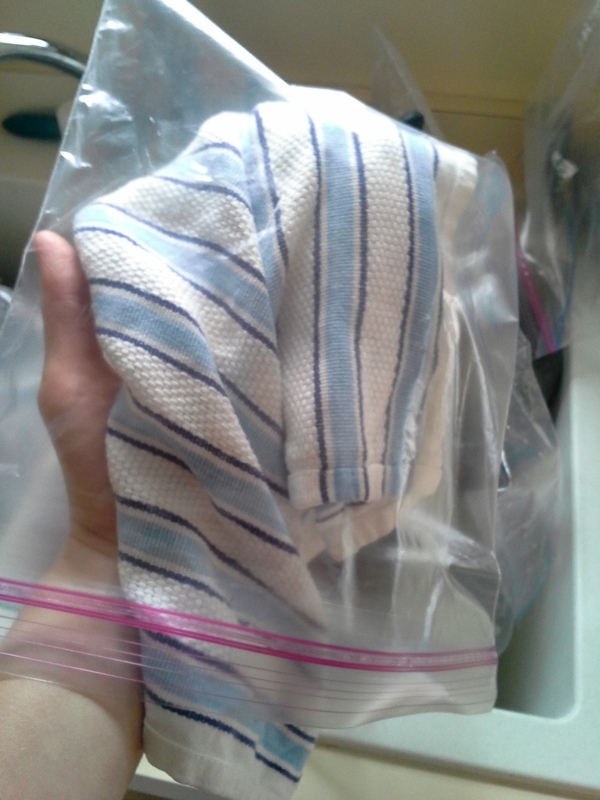 Me drying a freshly washed re-sealable bag to re-use again. All clean and ready to be used another time! Saved from the landfill…for now. What’s the one thing your parents made you do as a kid that you swore you’d never do as an adult, but do now anyway? Does anyone else recycle or self-cycle these resealable bags? This entry was posted in Family, home, Misc by Cathy O. Bookmark the permalink. I reuse them as much as possible, and will shake out/turn inside out, but generally draw the line at washing them out ;-). My Nana dries out her paper towels to reuse! Not only that, but she’s got about 150 rolls of them. She’s 91, so they should las her…. Wow – drying out paper towels is quite the process I’m sure! Way to be green Nana! Lol, she wouldn’t know green if Kermit the frog smacked her in the head. She’s just cheap. J/K. I think it’s a product of coming of age during the war, they learned never to waste. A good quality and one which we should revert back to, I think! ha ha – yes, I agree, it’s more of a cheap thing for my mom and her parents too! My grandma remembers growing up and told us about hobos coming to their farm looking for food. Their childhood was much different in the 1920’s and 1930’s! Cathy, I laughed over this one as I, too, vowed that I wouldn’t wash and reuse plastic bags and indeed, I do now! But I won’t make my own breadcrumbs with stale bread – I hated and still hate that messy chore. Ha ha! I’m glad I wasn’t alone in this one! I haven’t ever attempted to make my own breadcrumbs…it sounds like I should steer clear. They ARE expensive and probably don’t decompose too easily. It is kind of a pain to do, but worth it. Thanks for commenting!